In my continuing effort to shore up the glaring gaps in my education, I arrived at the work of Mircea Eliade, perhaps the 20th century’s most famous scholar of religion. Born in Bucharest, Romania, in 1907, Eliade manifested an early ambition for learning, reading widely and teaching himself both English and Italian as a teenager. He studied philosophy at the University of Bucharest before making the unusual decision to pursue graduate studies in British India, at the University of Calcutta, where he learned Sanskrit and studied under Surendranath Dasgupta, a distinguished religious scholar and author of a History of Indian Philosophy. By the time he returned to Romania, he had working knowledge of Sanskrit, Pali and Bengali, and a growing conviction that he had something important to say, and that his home country and culture was too small for his ambitions. His political allegiances within Romania are the subject of ongoing controversy: he flirted with nationalist and far-right groups, and expressed some sympathy for Mussolini and Romania’s Iron Guard; at the same time, he publicly repudiated anti-Semitism and the policies of Nazism. Sensing the ascendance of communism in Romania, Eliade left for France in 1945, and later accepted a teaching position at the University of Chicago in 1954, where he remained until his death in 1986. In those final years, he joined the American Academy of Arts and Sciences, published a series of best-selling books on religious symbolism and theology, and, through the influence of his university, set the standard for the study of comparative religion inside America for the next 50 years. Indeed, A History of Religious Ideas is still a standard textbook in American universities, and rightly considered Eliade’s magnum opus: the three volumes, published towards the end of his life, attempt an ambitious global history of religious ideas, spanning continents and centuries, beginning with the earliest civilizations. even of our own time, is spiritually opaque as long as it has not been successfully deciphered by being integrated into a system of meanings. A tool, be it prehistoric or contemporary, can reveal only its technological intention; all that its producer or its owners thought, felt, dreamed, hoped in relation to it escapes us. A fortiori, a belief in survival is confirmed by burials; otherwise there would be no understanding the effort expended in interring the body. This survival could be purely spiritual, that is, conceived as a postexistence of the soul, a belief corroborated by the appearance of the dead in dreams. But certain burials can equally well be interpreted as a precaution against the possible return of the deceased; in these cases the corpses were bent and perhaps tied. On the other hand, nothing makes it impossible that the bent position of the body, far from expressing fear of “living corpses” (a fear documented among certain peoples), on the contrary signifies the hope of a rebirth; for we know of a number of cases of intentional burials in the fetal position. One of the great strengths of this chapter is Eliade’s charting of the symbiotic relationship between tools and mythology. As mankind’s relationship to nature evolved as a function of our increasing mastery of technology, so too did our belief systems. Our mastery of fire and projectile weaponry effectively changed our relationship to nature, time and distance. The most consequential shift was our discovery of agriculture, and our gradual change from hunter-gatherers to farmers, for this fundamentally altered our relationship to time. It was no longer enough for [man] to ascertain certain future dates correctly by means of a rudimentary lunar calendar. From now on, the cultivator had to make his plans several months before they were to be implemented, had to perform, in an exact order, a series of complex activities in view of a distant and, especially in the beginning, always uncertain result: the harvest. This technological shift occasioned a spiritual one: no longer would we venerate animals, in the manner of shamanistic tribes; instead, our attention would focus itself on vegetal life, and “the mystery of birth, death, and rebirth identified in the rhythm of vegetation.” When Homer compares the lives of men to blades of grass, or when Shelley describes the life of a flower in human terms (“The flower that smiles to-day / To-morrow dies; / All that we wish to stay / Tempts and then flies”), both poets are drawing on symbolism that had already been deeply entrenched in their cultures for thousands of years. One of Eliade’s beliefs, as a scholar of religion, is that there exists a common architecture to all human religious belief, no matter how far distant the cultures in question, and so he is forever pointing out shared images and metaphors. In some cases, as in the Roman adaptation of Greek gods, that connection is literal, and we are treated to lengthy expositions on, for example, the various ways a conquering culture coopted the functions of the defeated culture’s gods and goddesses; in other cases, the connection is merely symbolic, but nonetheless telling. Is it an accident that religions and mythologies all across the world reserved a special place for the sun, for example, as a symbol not only of constancy but also of death and rebirth? More telling, still, is what appears to be our human tendency to evolve creation myths centred on heroic figures, whose actions – in defeating an enemy, founding a state, or sacrificing for the greater good of the group – become mythologized into a cosmogony (“Upon this rock I will build my church”). In Eliade’s telling, there is a close and perhaps unbreakable allegiance between the creation of a temporal state and the mythological creation of a universe. 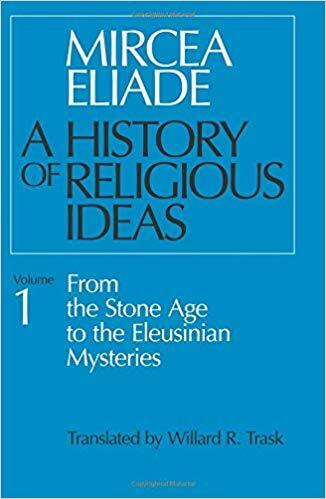 At several points, I struggled to follow Eliade’s arguments, as he presupposes a greater familiarity with the history of world religions than I possess, but that difficulty never prevented me from enjoying this grand tour of religious thought, or marvelling at the vast erudition on display. The final impression I am left with is a far greater respect for the complexities of theology, and a renewed sense that literature and mythology draw their strength from the same well.